When I paste some links or sensitive information by mistake on the Google Chrome URL Bar, that might trigger a search on Google. Does Google store all of them, including that sensitive information? The simple answer is "yes". Search engines store whatever is typed in the search bar. It has no way to determine what is sensitive or a password. It is all just text to the search bar. 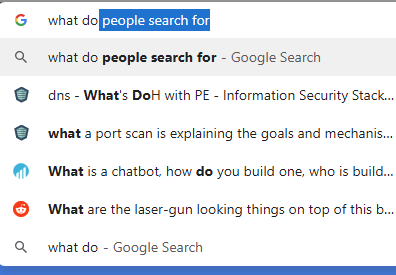 In Google, not only will it be stored in their logs, but what people put in the search bar (not attributed to specific people) can be queried by other people. In Chrome, whatever you put in the URL/search bar is stored locally in your account so that it can be provided to you as a short cut if you try to search for it again. So, as you can see, whatever is entered is stored, sorted, and categorized for later retrieval. Although URL bar is a search text box in chrome, Only pasting or typing doesn't get it saved in google DB. So if you have typed anything and erased, this will not come in your suggestions next time you try to search the same thing. But after pasting if you hit enter key then definitely yes, that will be saved. And not only saved but it will be data mined and used in other places like google trends(https://trends.google.com/trends/?geo=US). And if you are logged in, this search will also be linked to your account. Not the answer you're looking for? Browse other questions tagged google chrome data-leakage or ask your own question. When and Why does Chrome display malware detection warning?